so, it's been a while. there are massive changes happening in the herbanistic family and we can't wait to share them with you. until then...lemme put you up on game. i know i'm not the only vegan missing impromptu trips to Panda Express. the thought of long lines, greasy noodles, and free samples are enough to send me down memory lane. even with my recent craving of orange chicken - because let's be real, that was the only valuable item on the menu - instead of indulging in highly processed meat substitutes, i set out to create a vegan version using whole foods as a chicken alternative. what did i use? you guessed it: cauliflower. disclaimer: this doesn't taste exactly like chicken. i mean, how could it? it's a freaking cauliflower. don't get me wrong, when familiar tastes align it can most definitely trick your taste buds into thinking your eating something that you're not, but i don't want you biting into a piece of cauliflower expecting it to taste just like fried chicken. now, don't think for a second this dish isn't absolutely delicious. i put a lot of time and effort into the formulation of this sauce. when i say it paid off? bish...it. paid. off. although this recipe isn't necessarily hard, it does have a lot of steps. 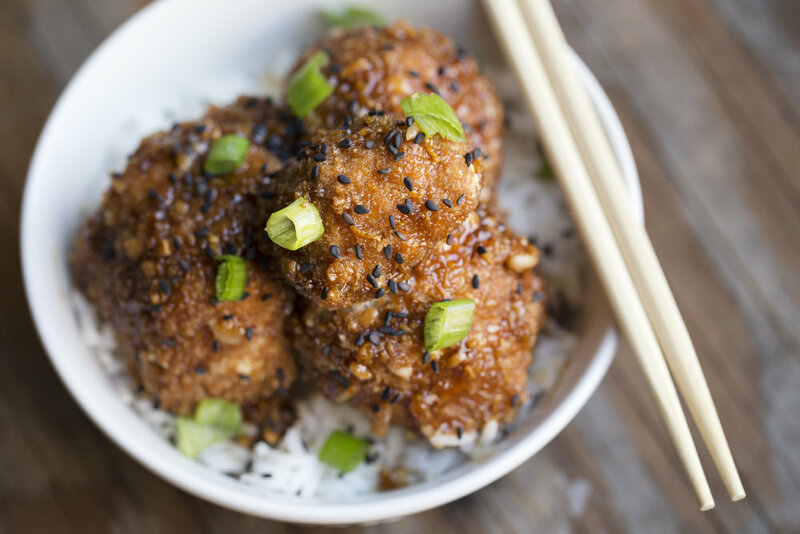 so as always, i've created a quick tutorial - under 5 minutes - that will show you have to make the best damn vegan orange chicken of your life. i'm not one to brag (okay maybe a 👌🏿), but this meal right here? bomb. if you decide to make this veganized orange chicken, let a femme know how it turned out. This recipe is for those who thought they'd never be able to enjoy orange chicken again after going vegan! 1. Preheat oven to 400 degrees Fahrenheit 2. Grab the cauliflower, then begin removing the outer leaves from the stem end of the vegetable. When majority of the leaves are removed, cut off the stem. 3. Going in again to get the smaller leaves under the florets, cut the cauliflower in half once you've removed as much as you can.4. Very carefully, cut each and every stem of the large florets. You want them to be medium to large in size, though you will have smaller pieces. 5. To make the cauliflower bites visually mimic boneless chicken, cut along the base of each floret removing as much of the single stem as you can.6. To make a diluted flax egg, use the ratio of 1 tbsp of ground flax seeds to 5 tbsp of water. The amount you need will depend on the size of your cauliflower but start with 3 tbsp of flax seeds. 7. For the breading, cover each cauliflower floret in the flax egg then the breadcrumbs. Place them on a parchment paper lined baking sheet when you finish. Bake for 30 minutes. 8. For the sauce, combine the hoisin sauce, soy sauce, white vinegar, sriracha, brown sugar, salt, and the juice from the orange. Be sure to zest the orange before squeezing out the juice!9. Chop your garlic and ginger.10. In a pan on medium-low heat, melt the coconut oil, then cook the ginger until brown. Add in the garlic, then cook for 1-2 minutes. 11. After that, add in HALF of the orange zest. After 30 seconds, add in the sauce mix.12. Bring the sauce to a low boil, then add the other half of the orange zest. Whisk everything together.13. Give it a couple of minutes to cook, then slowly add in your cornstarch slurry (1 tsp of cornstarch that has been mixed with 1 tsp of water) while stirring. Let it cook until it thickens.14. Once the sauce thickens, do small batches of cauliflower in the pan to coat them. Coat evenly, then serve over rice. By joining, you'll receive a weekly newsletter of herbanistic's activity.